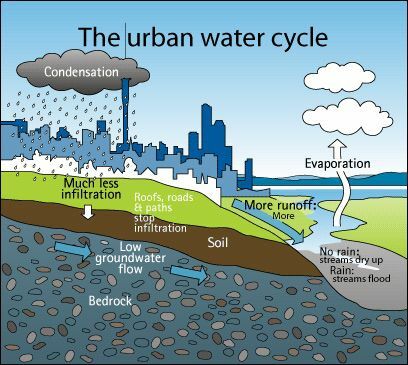 The Urban Water Cycle. Auckland Council. Students use interactive computational models to explore the relationship between infiltration and recharge in natural and urbanized areas. They investigate how human development has changed the natural flow of water. Students explore the transfer of water from one aquifer to another and propose solutions to allow for water extracted from wells to recharge the aquifers from which they came.